2009 "supplement/addendum" is embedded within the April 2010 printing. "Final Exit Digital Edition" is available as a downloadable eBook PDF. To order visit the "Final Exit Digital Edition" product page. Final Exit 3rd Edition book/eBook and the Final Exit DVD video are a matched set and complement each other. The Final Exit video is also available on VHS. This is the most famous textbook in euthanasia and assisted suicide. There is unique step-by-step language for the competent adult who is terminally or hopelessly ill to bring their life to a peaceful, non-violent end if they wish. This can be achieved without Dr. Kevorkian or any doctor. Drug dosages and helium gas techniques are described and illustrated. Much the same methods are used by Dignitas in Switzerland, and the right to die groups in Holland and Belgium. 'Final Exit' also outlines the legal complications connected with dying, death, hastened death, euthanasia laws, suicide, Living Wills and Advance Directives. The family aspect is discussed and the advisability of a 'suicide note' (with sample) is addressed. The full Oregon Death With Dignity Act, which permits physician-assisted suicide for the citizens of that state, is included as an appendices. The problems with life insurance are discussed. The updated third edition of 'Final Exit' is much changed from the earlier editions, which date from 1991 when it was, to the surprise of many, the Number One bestseller on the New York Times nonfiction list. For instance, the first and second editions did not contain the helium gas technique now used by hundreds of people for their own euthanasia. The revised 3rd edition also includes new drug dosages plus updated guidance on plastic bag and other techniques. In April 2007, USA TODAY selected 'Final Exit' as one of the 25 most memorable books published in the last quarter century. 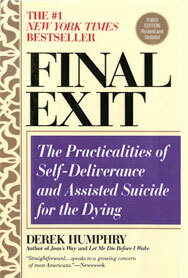 The papers' editors and critics said: "The topic of assisted suicide exploded in controversy in the 90's, thanks to the Michigan pathologist Jack Kevorkian and his suicide machine, and this how-to manual [Final Exit] from an English journalist who helped his cancer-stricken first wife kill herself." If you are asking the question 'what is assisted suicide?' or 'what is euthanasia and assisted death?' then this exit book provides the clearest answers. There is, as yet, no simple 'peaceful pill' for self euthanasia, and law reform is lagging behind public opinion, so until then 'Final Exit' is the solution. Read an excerpt from 'Final Exit' at USA Today. Chapter 12: Who Shall Know? Chapter 18: How do you get the magic pills? Today Derek Humphry runs the Euthanasia Research and Guidance Organization, a nonprofit organization based in Oregon. He is an adviser to the American group, the Final Exit Network. 1. Visit the ERGO-Store to order securely by credit card, e-check, PayPal payment or regular check/money order. 2. Print out ERGO's ORDER FORM to pay by check or money order. Pay securely with any major credit card or e-check through PayPal. Checks and money orders are also accepted in the ERGO-Store.